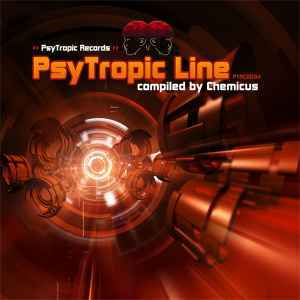 Psytropic Records in Germany is out with their fourth compilation, as usual compiled by Chemicus. Here they continue releasing full on psytrance by pretty well known names in the scene. The compilation starts off with an oldtimer in the psytrance scene, Manmademan from the UK. They know their work, and serves a pretty good opening track with some nice psychedelic ingredients. Track 2 is by Audiomatrixx who hasn’t been releasing much, but here they serve a pretty nice track, with some mystic, melodic and pumping vibes. Not a bad track. Genetic Spin is most known for their progressive trance tracks on Creamcrop etc., but seems to have gone towards a more full on sound lately. Here they lead us into a pretty dark soundpicture, with a groovy, rolling bassline and trippy vibes. One of my favourite tracks on this compilation. Track 4 is by the mystic PsyNina. A girl in Germany, that has been discussed on the Isratrance forum for months if she really exist. I don’t think the discussion has resulted in any final answer yet, and the discussion keeps continuing. Anyway, here is a track by someone called PsyNina at least... Not bad either, with an intense, hypnotic rhythm drift and some nice psychedelic sounds swirling in above. Track 6 is by Altöm from France, who has released several of my all time favourite full on tracks on Italian Neurobiotic Records. Here they give us another melodic morning trance track that should fit well at sunrise. Some parts sounds a bit too fluffy for my taste though. Track 6 is a collaboration between two Israeli full on artists, Cosmic Tone and Ultravoice. These guys does it just like most other Israeli full on artists these days. Quite fluffy full on, but less clubby vibes than usual from the Israeli crowd. Still, a really drifting track. Track 7 is by Neuromotor who continues his full on, intense sound. Still, this track is a little bit better than most tracks I have heard by him lately. Then we get a track by PTX, who has been pushing out some pretty interesting full on tracks lately. Here we get another massive, stumping track, going a pretty dark direction. An ok track, but there could have been some more variation in there. Track 9 is made by InterSys and the mystic PsyNina. This track should be something for the morning dancefloors, with some pretty light melodies and a drifting vibe. Still, some parts become a little bit too fluffy for my taste. The last track we get on this compilation is made by Chromosome from Sweden, who makes his tracks somewhere between progressive trance and full on. He is also behind projects such as Andromeda and Soul Surfer. The track we get here is a happy, melodic track with a lot of melody and floating sounds. Nice track to finish the compilation with. Psytropic Records does it slightly better than their previous compilations here, with some strong names and some tracks that will do well on full on dancefloors worldwide.